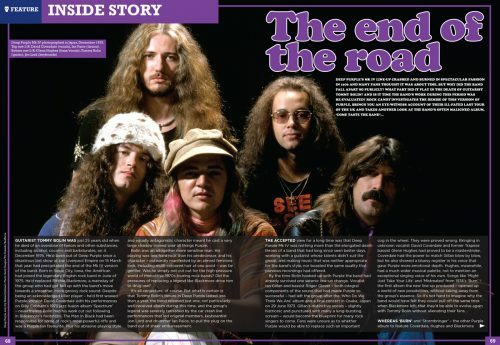 Rock Candy magazine has a 4-page spread on Deep Purple Mark 4 in their February-March 2018 issue. The full article is available online as a PDF file or you can purchase the issue in question. Thanks to Benny Holmström for the info. Posted by Nick Soveiko on Wednesday, March 14th, 2018, filed under News. You can follow comment on this post through the RSS 2.0 feed. You can skip to the end and leave a comment. Pinging is currently not allowed. Coverdale couldn’t sing on key or carry a tune. Tommy Bolin and Glenn Hughes performed very bad because of their drugs addiction. Absolutely love CTTB. Have grown and grown over the years. Mark IV has ways been an avant-garde musically creative line up. Even today, CTTB sounds as fresh, powerful and new as ever. Although I profoundly hate saying I prefer this or that record, well, in this very case, CTTB is the most striking of all the studio records. Hi…”Come taste the band” was a great album . The most recent reiusse (the 2 CD version) brings a new dimension to the sound of this work. HIghly recommended. IMHO , “Come taste the band” is better that some albums of the Morse era. Any avid Purple fan already knows most of this story from other sources.A decent article,though. I did not know the quote attributed to Bolin at the end. A very auspicious time to print this article as today is March 15 the date of Mark IV’s last concert! You can’t blame it on the drugs abuse entirely, it was a natural end to an era of late 60s early 70s hard rock/heavy metal. Even Ian Gillan and Roger Glover could not have saved the band from collapsing if they were to remain in. When I first read The End Of The Road,I thought the plug had been pulled on The Long Goodbye Tour sooner than expected. As much as i couldn´t stand CTTB (becouse Blackmore didn´t played on it) as much I love it nowdays.Better than most off the post ´84 albums. True DP classic. Come Taste The Band! What a magnificent Deep Purple album. All killer, no filler (ah well, even the filler I Need Love is excellent, lol). Especially the Kevin Shirley remixed and remastered version. All players are in top shape especially Tommy Bolin. At the time a very underrated album and blown away in the press by the Ritchie Blackmore’s Rainbow debut album. In hindsight Rainbow’s first album is a very lackluster affair, with only 3 good songs on it and a very murky, dull production that did not stand the test of time. Ok it introduced us to the late, great Ronnie James Dio. But changing Lord, Paice, Coverdale and the multi-talented Hughes for a mediocre band like ELF is just crazy…..
I’ve always liked Come Taste The Band…a nice blend of edgy rock with funky/soulful element. There is some good stuff there and good production. That the supporting tour went to hell in a hand basket isn’t surprising given the drugs. The Zen of Then: They couldn’t be where they are today without that experience as a cobblestone in the path. It all leads to this moment. Even though the performances on the 1976 tour swayed from good to awful, at least the show at Long Beach was one of DP’s best of the tour. It was also recorded live for a radio broadcast and eventually released on cd. What happemed to the documentary? There are concerts available since they were filmed for the in-house screen. Live they weren’t up to much (poor Tommy just wasn’t the player to replace our Ritch) & I was at the Wembley gig but CTTB is a fantastic album, different yes, but nevertheless a great album in it’s own right. I saw this Deep Purple line- up in Providence Rhode Island 1976. (Nazareth opened. *Nazareth were great btw) Bolin was awful and Hughes (who is a monster talent) appeared fairly out of it. I was bummed and missed Blackmore. Ian Paice was playing incredible during this era. Jon Lord was typically great too. That first Rainbow album never left my turntable that whole summer and even to this day I feel is just a magical album. It was a nice write up, but so much inaccurate info that has been passed down through the years. Nice they tried, though. Is the documentary you mention Phoenix Rising (2011 ) ?? A few quotes/facts from this article come from it. As well,I don’t believe in-house screens were commonplace in the 70s.Whatever view you had of the stage,that was it.The only widely available footage of MkIV is Deep Purple Rises Over Japan,which is also on Phoenix Rising. Since the DP article was available to read on the net I was not going to get the magazine until I noticed that there was an article on Heavy Metal Sunday during the 1983 US Festival. I was there so I had to buy it and it just arrived so I will be enjoying it this weekend. How about enlightening us on that inaccurate info that has been passed down. Maybe we will all learn something new, or maybe just me. I have discovered a mistake in the pdf . Coverdale interviewed in 1975 New Zealand when asked about drugs groupies and hypodermic needles. States quite clearly as light as day ??!!! Lots of info /dirt . Don’t have time to go through it now . But I will read the whole thing . Thanks .